The self-publishing phenomenon is upon us. Whether this is a good or bad thing is left to the eye of the beholder. The point is that writers are discovering they no longer have to solicit the major publishers to get their books in front of avid readers. They are discovering that they can self-publish on their own or via a third-party publisher. The problem is figuring out the “who, what, when, where and how” of the business to give their new book the best chance at success. 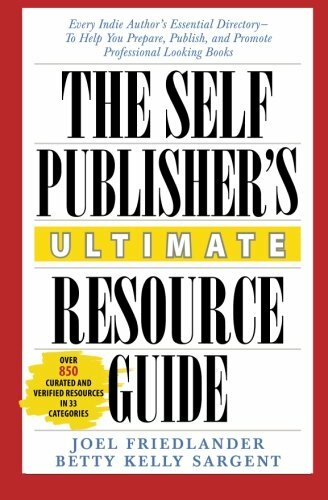 The Self-Publisher’s Ultimate Resource Guide, a new self-publishing handbook by Joel Friedlander and Betty Kelly Sargent, may be the most practical book for this type of endeavor. From the opening pages, Mr. Friedlander and Ms. Sargent identify one of the biggest challenges of becoming a self-publisher: “figuring out who’s who, what’s what, and where and how to find the right resources to make [your] book the best it can be.” To begin this discovery process, the authors section the book into three practical and intuitive parts: Prepare, Publish, and Promote. The “Prepare” section includes a treasure trove of links to and websites of professionals (copyeditors, proofreaders, indexers, illustrators, etc.) in the business who can tweak and polish manuscripts to perfection before publication. It also lists grants to help with funding, books on craft of writing, and professional and trade associations that are all designed to help writers hone their craft. The “Publish” section includes resources on how to convert a manuscript into various formats like eBooks, print books, and audiobooks. There is also a detailed list of subsidy publishers, book production software sellars, short run printers, and POD (print on demand) services to accommodate almost every budget. The “Promote” section may well be the most helpful section for newbie self-publishers. Self-publishing is still a fairly new business model, so many writers have no idea what is required in order to flourish. Many focus only on writing and printing/publishing their book, often forgetting that the completed book is only the beginning; the product must also be promoted if readers are to learn that it even exists. Therefore, the Promote section includes links to website designers, book reviewers, and social media consultants. Authors can find where to list their ebooks and how they can get a press release out. There are also resources on consumer protection, book blog sites, social media suggestions, and available book awards for self-published authors. The Self-Publisher’s Ultimate Resource Guide has everything a newbie (and even a veteran) needs to get started on a new project. Each topic within each section includes a brief but clear description of what writers will find inside. For example, the Best Books on Writing section explains that “all writers need a little help and inspiration from time to time,” then follows up on with an outstanding list of books on the art and craft of writing. The Grants and Funding for Writers section explains that there are lots of public and private grant programs out there that most writers aren’t even aware of and then lists these valuable resources for further exploration. These are only a couple of examples of the wealth of resources in this must-have handbook. Self-published books are definitely taking their share of the publishing market. In fact, Smashwords Founder Mark Corker predicts that “self-published books will account for 50% of ebook sales by 2020.” Whether these numbers are accurate or are actually conservative, The Self-Publisher’s Ultimate Resource Guide can still serve as an invaluable resource to help this burgeoning group of aspiring authors do it right the very first time.